The Last Word Cocktail has had an erratic history — which is fitting, I suppose, for drink that was born (surreptitiously) during Prohibition. It was created sometime in the 1920s at the Detroit Athletic Club — by a vaudeville performer, not a bartender — but didn’t become particularly popular (maybe because of that bathtub gin they used?) The drink was all but forgotten until 1951, when Ted Saucier described it in a book about cocktails called Bottoms Up, reintroducing this cocktail to a whole new audience. But most of his readers promptly forgot about it, and the drink was lost again. It was rediscovered about 8 years ago, when Murray Stenson (of Seattle’s Zig Zag Café) saw the recipe while flipping through Saucier’s Bottoms Up. He put it on the cocktail menu at Zig Zag, where it became an instant hit. After its successful (re)launch in the Pacific Northwest, The Last Word made its way to New York — and then to cocktail glasses around the globe. It’s still not widely known to the general public, but it’s a drink that cocktail aficionados cherish for its pungent, rich flavor. The Last Word is a refreshing drink with a bit of a bite — pleasant in warm weather, but with enough substance to stand up to crisp fall evenings. And because it helps sharpen the palate, it’s one of the best pre-dinner drinks I know. Give it a try, and I promise it won’t be the last one you have — you’ll return to it again and again. There’s one downside to this cocktail: It requires two pricey ingredients — green Chartreuse and Maraschino liqueur — that aren’t in most home bars. Chartreuse we’ve used before (in the Champs Élysées Cocktail back in July). The other semi-obscure ingredient, Maraschino, is a bittersweet, colorless liqueur with a slight almond flavor; it has nothing to do with the garish red maraschino cherries that we use as a garnish in cocktails or on banana splits. If you don’t want to invest in these ingredients, you might want to try The Last Word at a restaurant or cocktail lounge that has them on hand (not all will). If the bartender doesn’t know how to make it (many won’t), the recipe is easy: equal parts of gin, green Chartreuse, Maraschino liqueur, and fresh lime juice. Once you taste this cocktail, though, I think you’ll agree that it’s worth purchasing the ingredients so you can have it at home. This recipe serves one, and takes about 5 minutes to prepare. If you want to make a heftier drink than my recipe produces, simply scale the measurements of each ingredient up to ¾ ounce, or even a full ounce. (That last makes a pretty stiff drink, however. As you’ll recall from our discussion about the Champs Élysées Cocktail, green Chartreuse is 110 proof). Combine all ingredients (except garnish) in a cocktail shaker half-filled with ice. Shake vigorously (20 to 30 seconds) until the drink is cold. Strain into a cocktail glass (preferably chilled). 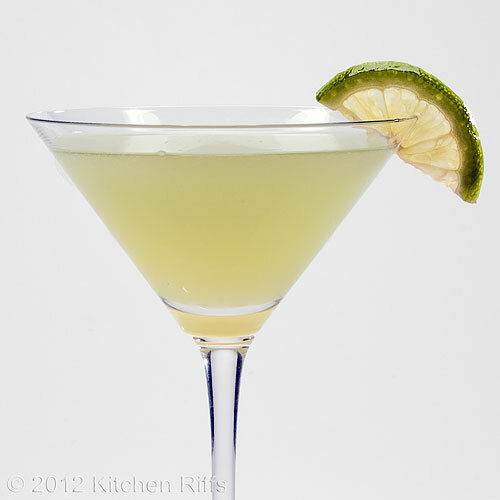 Although this drink is often served ungarnished, you may choose to add a lime slice, wheel, or twist. Because there’s citrus in this drink, you should shake it (the citrus will make the drink cloudy, so the bubbles you generate by shaking won’t matter, and shaking is the best way to incorporate citrus into a cocktail). For more info on when to stir and when to shake, see Cocktail Basics. Robert Hess has a nice video with instructions on how to mix The Last Word. Maraschino liqueur is made from Marasca cherries, including the crushed cherry pits. This liqueur was developed at a Dominican monastery in Venetian Dalmatia during the 16th century. It wasn’t named “Maraschino” until about 200 years later, when industrial production began. 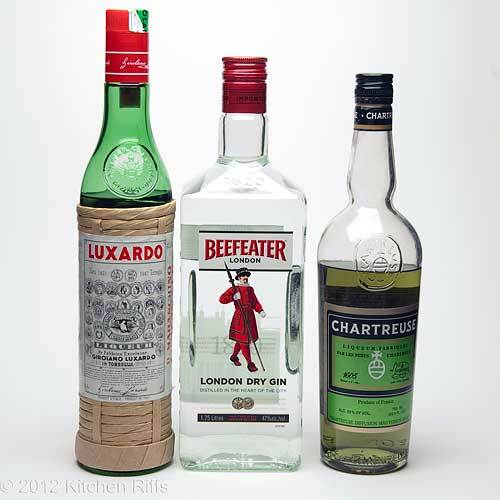 Napoleon Bonaparte was a big fan of Maraschino liqueur, as were Czar Nicholas I and Britain’s George IV. This summer we’ve been featuring a different summer-appropriate cocktail each week during our Summer Sippin’ Series. But we’ll soon be back to our normal (monthly) cocktail post schedule — at least for a while. We’ve had so much fun with the series — and received such great feedback — that I’m pretty sure I’ll be doing it again next summer. How about “Son of Summer Sippin’ Series”? There’s a whole world of cocktails out there, and we’ve barely scratched the surface! The drinks we’ve tried this summer have been terrific. We started the series in May with a primer on Cocktail Basics, following up with the Mojito Cocktail. In June we mixed the Tom Collins, the Sloe Gin Fizz, the Bellini, and the Gimlet. In July we made the Betsy Ross Cocktail, the Champs Élysées, the Tequila Sunrise, and the first of several Tiki-themed cocktails, Planter's Punch. We also learned how to make our own Homemade Grenadine. In August we started off with the king of Tiki, the The Zombie. Then we featured the Fog Cutter Cocktail, the Singapore Sling, the Piña Colada, and the Bermuda Rum Swizzle. And now in September, we’re wrapping up the series with The Last Word. 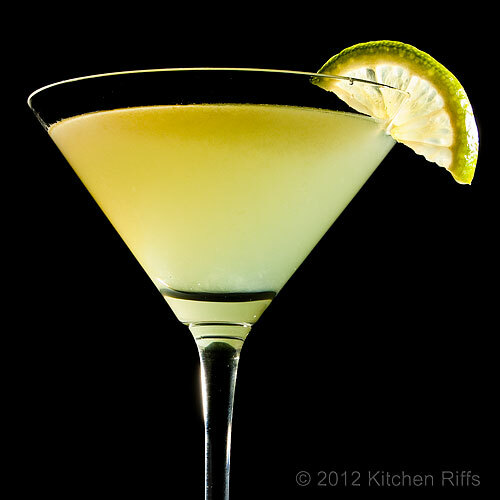 Which will be the last word about cocktails on Kitchen Riffs until October — when our next monthly cocktail post arrives. I must admit, I'm not quite ready to bid my farewells to summer. However, if I must, The Last Word Cocktail seems like the perfect way to go. I've actually saw this recipe before in a copy of the Bottoms Up book I once had in my collection. If I recall, it wasn't a "hefty" sort of cocktail book but it was timely. I do believe I lent it to someone who never returned it. Thanks for sharing, Kitchen. Here's to you and the Mrs. and the next round of cocktails! Hi Louise, one of the more interesting aspects of Bottoms Up are some of the illustrations it contains. But it's not one of those massive collections of cocktail recipes one sometimes sees. And it's tempting to do something re National Bourbon Heritage Month, but that may have to wait until next year. ;-) Thanks for your comment. Hi CCU, when your weather turns warm, you can just come back and read the Summer Sippin' Series all over again! ;-) Thanks for your kind words, and comment. Loved reading about this drink, makes it even more interesting!! Hi Reem, cocktail history is so interesting! And there are so many fun drinks to explore and enjoy. This is one of the really good ones. Thanks for your comment. I adore anything with the essence of almonds so Maraschino liqueur has been added to the top of my shopping list. Your recipe comes on the heels of our air conditioner last days. The weather is in the high 80's in Colorado so it's the perfect night for a refreshing cocktail! Hi there Kitchen Riff! I think your writing is getting better and better. You do have great cocktails and gorgeous photos but it is your words of alcohol wisdom are what make your site a happy place to be. Hi Rebecka, there's a bit of cherry in there, of course, and also something that might be chocolate (! ), but almonds is what I notice most (cherries are kinda almond-like to, at least to me). Hope you enjoy it! Thanks for your comment. Hi Bam, gosh, thanks - enough practice and the writing should get better, yes? ;-) Such a kind comment all around - thanks so much. Hi Chicago John, spirited indeed. ;-) I think a lot of people have had problems with gin - it's one of the "first" liquors a lot of people overindulge in - and its aroma is so distinctive even a whiff puts them off. But it's marvelous stuff. Maybe try a gin and tonic? The tonic will mask some of the gin aroma. And I suggest Plymouth gin - I've served that in mixed drinks to people with gin phobia before, and they didn't actually realize they were drinking gin (its aroma is a bit less distinct than some other gins, or at least I find it so). Thanks for the comment. Hi Carolyn, if you like a bit of bite this one's for you! ;-) It really is delicious (I know, the writing authorities say that's an overused word - it just happens to be true in this case). Thanks for the comment. This sounds like this would be the perfect cocktail. And as always I love your pictures. Hi Tania, spring for you, fall for us! And this drink is perfect for either one. Thanks for your comment. Hi Words of Deliciousness, it's really quite good - terrific flavor and quite refreshing. Thanks for your kind words, and your comment. Hi Marina, it is a little amusing - rather ironic! Alas, there's no fooling Mother Nature - I can make all the cocktails I want, but cooler weather is definitely coming. Thanks for the comment. Hi Terra, I'm a bit sorry to see the end of the Summer Sippin' Series (at least until next year), but there are so many food posts I want to write too! Hard to fit it all it. Glad you found the recipes useful (make a few drinks and it gets much easier). Thanks for the comment. I love the Last Word! I've never made it at home since we don't have chartreuse, but we always have maraschino on hand since we love the aviation cocktail. Also I've made real maraschino cherries with it! They are very different from the overly sweet bright red variety in shirley temples :-) Great post, love the history as always. Thanks! What a great way to end this series! Now I'll have to go back and read the post about when to shake and when to stir. I always thought that was just a James Bond witticism, and had no idea that it actually mattered! I Katherine, I love the Aviation! It's a wonderful drink. I've not yet made my own maraschino cherries - something I'm looking forward to doing. I'll have to check your blog to see if you've posted that recipe! Thanks for your comment. Hi Beth, it's been a fun series! I'm missing it already, but there are so many other things I want to write about, too. Thanks for the comment. and i love the color of this drink plus your photography is stunning! the yellow looks so bright against teh black background! Hi cakewhiz, there are good things about summer being over - all those great hearty soups and stews! But I know in a few months I'll be longing for warmer weather again. Thanks for the kind words, and the comment. I'm sad to see the Summer Series coming to an end - I have really enjoyed it! I need to get over to Zig Zag now that I am living in Seattle. Great drink! Hi everydaymaven, I'm kinda sorry to see it come to an end to - I had a lot of fun! Drinks won't disappear from the blog, but they're definitely taking a backseat this fall. Thanks for the comment. Hi Ali, it was the most appropriately-named drink I could think of for the last in the series! Plus it's a terrific cocktail - really excellent. Thanks for the comment. When I saw the title I was afraid this would be the last of the series. What a great series John! I've learned alot about the history of drink (including this one) and about ingredients. It's been fun! The Last Word sounds quite refreshing and tasty and has a very interesting history. I hope I remember to order it some time soon. There's restaurant near by with a bartender that I bet knows how to make it. A very fitting end! Hi MJ, it's a good drink - I think you'll enjoy it. I love the flavor. Thanks for all of your kind words (as well as taking time to comment, of course). The series was a lot of fun, and I'll be doing it again next year - but probably time to take a break. Although I'm already thinking about what's going to be in the series next year - I have a lot of ideas! This summer went by too quickly. Another lovely cocktail and a great one to end the series. I have enjoyed reading the history behind the drinks. Many thanks! I love lime juice and drinks with a bit of bite, so that cocktail is to my taste! Great color too. Hi Biren, the summer definitely went by too quickly! Thanks for your kind words, and the comment. Hi Rosa, I agree about the color - it's such a pretty drink! Thanks for your comment. Hi Hotly Spiced, although this is a terrific cocktail, unless you're wild about it, it's pointless in buying the ingredients. There are a few other cocktails that require these (particularly the Maraschino liqueur) but probably not enough to make it worth your while unless you're doing a Summer Sippin' Series. Of course your summer is in front of you, so opportunity is knocking! Thanks for your comment. Very interesting history for this cocktail and in my knowledge you became very famous with cocktail making! I know where to look for and refer to, when I or someone needs great cocktail recipes. You did such a fantastic job on sharing all the cocktails. I really enjoyed it, and not to mention, you photograph really amazing pictures of drinks! I became more educated about cocktails thanks to you! i enjoyed reading your cocktail series. I learned a lot. Although there are a lot of cocktails that I thought I cannot make due to its ingredients, but this one I think I could make. 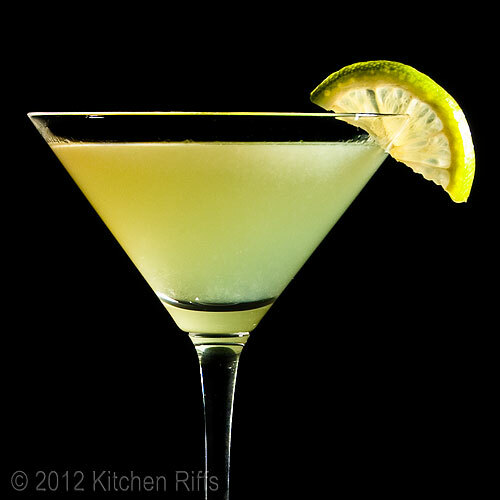 It reminds me of my favorite drink in the 80's we called gimlet. Hi Nami, thanks so much for your very kind words (and your comment, of course). I really appreciate it - thanks. Hi Jay, lip smacking and lip satisfying! So tasty. Thanks for the comment. Hi Malou, thanks! This has very similar color to the Gimblet, but the Gimlet is on the sweeter side - this isn't dry, but drier than the Gimblet and with a more austere flavor. Thanks for the comment. Those expensive ingredients are probably why it became "lost". I love it's name and the idea of it being lost - a bit like the lost city of Angkor Wat until it was rediscovered by the western world. It's that air of mystery that appeals. Hi Ray, thanks so much! And of course, thanks for taking time to comment. I hope you enjoy your weekend too. Hi Suzanne, I expect you're right that the comparative rarity of the ingredients in part caused this drink to fall out of favor. But it's too good of a drink to remain lost! Thanks for taking time to comment. Summer is gone. It has been raining nonstop for the last four days. Would it be wrong if I still want a glass of your delicious cocktail?! Hi Baker Street, now is exactly the time to have one! It'll chase away the rain. ;-) Thanks for your comment. This looks just wonderful. I love the idea of it, and the addition of lime juice makes it my kind of drink! Hi Amanda, lime is my favorite citrus in cocktails - such a nice flavor. This drink is exceptionally nice, IMO. Thanks for your comment. Hi Jenny, it took a long time to build up the bar stock we have! This really is a lovely drink - probably a somewhat different flavor from anything else you've had. I hope you and Yuye like this. Thanks for your comment.